Recently, I ordered the Time Long-Coat and it arrived after three weeks. I'm in love with this coat! The quality is excellent and the measurements are perfect. I ordered the Faix Seude material, although it is more expensive, it is worth it! I tried the coat over one of my suits and it had this final touch. The coat is quite warm, so I think it is perfect for cold winter days. 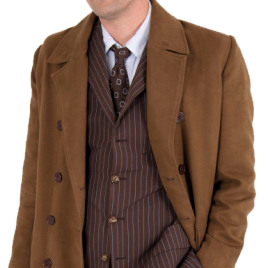 Although the coat is based on the Tenth Doctor coat, most people won't associate it with Doctor Who. It is elegant and simply beautiful. Thank you so much for this lovely piece of clothing!